My wife, Diane, and I are completing our fifth year living outside the U.S. We began our expat lives in a tiny village on Ecuador’s northern coast. It was a great place for us to start but, after a couple of years, it was time to try something else. Somewhere a bit larger, with a few more of the comforts I’d grown to appreciate over the years. And someplace closer to the U.S. for those occasional trips to see friends and family. From a tiny Ecuadorian fishing village with dirt roads and one ATM machine, we moved to the Caribbean’s number one vacation destination; a bright, shiny city where the streets are paved, the palm-studded medians in the Hotel Zone are perfectly groomed, and ATM machines are on almost every corner. 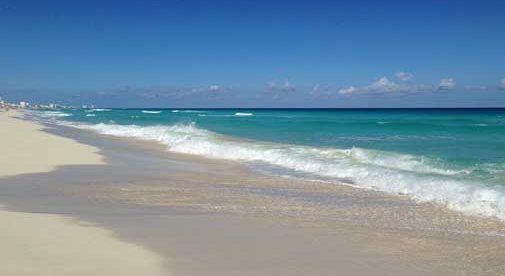 Cancún, Mexico, gateway to the famed Riviera Maya, has been our home for the past three years. Situated on the Yucatán Peninsula’s east coast, this tropical haven is brushed by the warm, turquoise waters of the Caribbean Sea and offers every type of water-based activity you can imagine. With the world’s second largest reef system just offshore, fishing, diving, snorkeling, boating, and swimming lead the list—with sailing, submarine reef tours, mangrove tours, and kayaking following right behind. And when you tire of hanging out on the water, Cancún offers over 700 restaurants, numerous large shopping malls, night clubs, museums, modern movie complexes, big-box retailers, well-stocked supermarkets as well as traditional open markets, major hospitals, and, most importantly, easy access to the rest of the world via a bustling international airport. Florida is less than two hours away. And our love for road trips is easily satisfied here. At least twice per month, we’ll throw our backpacks into the Jeep and head out to explore the culture-rich Yucatán Peninsula. For those seeking traditional Mexico, you won’t find it in Cancún. Cancún was intentionally built to serve the interests of the international tourism industry, with dozens of shiny hotels and resorts lining a stunning, perfect sugar-sand beach. In the touristy part of the city, many who work in retail businesses speak English, so those arrivals seeking only a suntan and a hangover don’t need to worry. But for those of us who live here, we know the other side of Cancún. Get away from the Hotel Zone and check out el Centro, downtown Cancún where English is a foreign language and small, family-owned businesses thrive. It is here where you will find a small taste of real Mexico, with a strong Maya influence, and the best restaurants are found along the side streets, close to the neighborhoods where the locals live. Or take advantage of a modern highway system: drive or buy an inexpensive bus ticket to the colonial cities of Mérida or Valladolid, to explore traditional Mexico. Or travel south to the beautiful city of Chetumal, on the border with Belize. Living in Cancún is life without compromise. The city offers every convenience at a cost that is greatly reduced from life north of the border. Living here is much cheaper than vacationing here. But more importantly for us, Cancún permits easy exploration of the rest of Mexico, and has the convenience of an international airport.